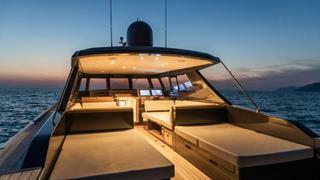 Italian studio Nauta Design has launched its first custom designed sailing superyacht chase boat; the Nauta Tender 48. The 14.62 metre tender features exterior and interior design by Nauta Design, naval architecture by Francesco Rogantin, and was built by Maxi Dolphin in Italy. The owner also wanted to use the boat for “occasionally short, autonomous cruises” in its own right. Two sunpads, which can be extended to the shaded area under the hard top, sit aft. The cockpit meanwhile features two symmetrical seating areas around mahogany tables, which can be used as either dining or coffee tables. 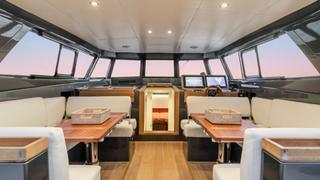 Aft of the galley is a large service space, with a washer/ dryer and wine cooler. 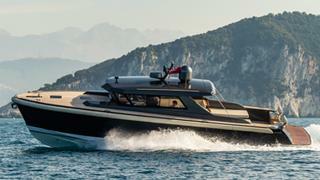 Powered by a pair of 600HP Cummins engines and Rolls-Royce waterjets, the Nauta Tender 48 has a top speed of 37 knots.